A web-based application for CodeShare Management which allows airlines network planning process departments to verify and share flights in a time and cost effective way. Through a user-friendly and fully responsive interface, the user has a full view of the best available flight connections and intervene where needed, in order to better suit the airlines business needs. Real-time codeshare assignments, evauation and creation of opportunities, human error minimization, efficiency improvement, cost and effort reduction and revenue increase. In a world where aviation advances have minimized distances, airlines strive to build their own passengers communities. In order to inspire a much wanted loyalty, they need among others, to provide them with many different destinations, even to locations they don’t service. That’s where codeshare comes in. Through commercial agreements, whether as operator or marketing partner, each airline builds a whole new “shared” flights network utilizing SSIM files. It’s a painstaking job that demands focus, dedication and prompt actions. Syndesis, a web-based application for codeshare management, allows airlines network planning process departments to verify and share flights in a time and cost efficient way. Creating the “right” shared flights can be puzzling; one must take into consideration several pieces of information, such as: rules that are applied due to business agreements and international standards, minimum connection times, flight-schedules etc. By loading the pertinent SSIM files (for both the operator and marketing partner), the Routes Calculator provides you automatically with the best available flight connections, within minutes, eliminating the risk of human error. Through a user-friendly and fully responsive interface, the user can have a full view of the best available flight connections and intervene where needed, in order to better suit the airlines business needs. Syndesis provides the best connections which are calculated using the MCT generic restrictions and the selection mode that has been applied per rule. The application returns the top 3 best connections per rule, pre-selecting automatically the optimal. After that, the choice is up to you to intervene and manually select or reject connections. Thanks to highly automated procedures, such as the detection of mishaps in terms of flight numbers (not available, unsuitable etc), the generation of operating and marketing flights (with flight numbers assigned) is made easy and accurate, honoring existing business agreements and optimizing day to day work. Parameterization is one of the most important features of Syndesis. Through designated interfaces, users can create rules of their choice by setting the criteria applied for code sharing (route, number of hops, acceptable connection time, matching flights using best connection time, elapse time etc.). These rules can be applied on all levels, while the hierarchy of their execution can be modified to better suit your business needs. You can also define the way codeshare flight numbers are assigned. You can set the desirable numbering rules which will be executed in an order predefined by you. The numbering rules are flight number ranges, dedicated flight numbers, daily orderings and odd/even ranges. In each numbering rule the execution order can also be defined giving you the freedom of choice. Unforeseen flight-schedule changes can bring havoc to your codeshares. 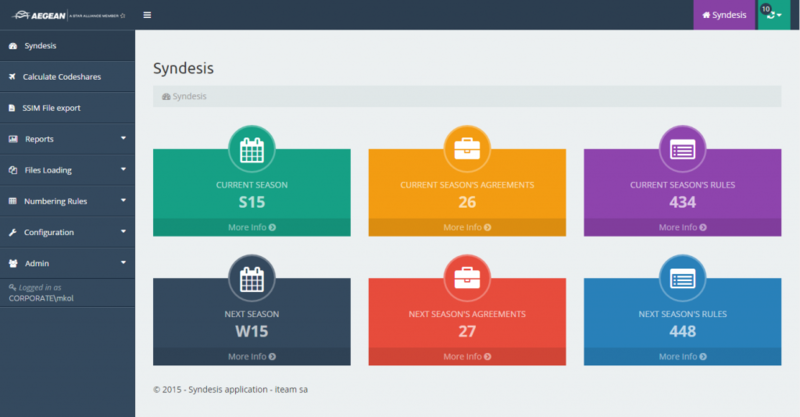 With Syndesis you can run real-time codeshare assignments whenever you want, as many times you want. By comparing SSIM files or comparing SSIM file with calculated data, you can pinpoint the differences, focus on them and resolve any problem before it affects your passengers. It will only take you a few minutes, it will save you a great amount of money and it will help you maintain the hard-earned prestige of your company. Thanks to its business analysis capabilities, Syndesis offers an insight on how successful a partnership is (from both the operator and the marketing partner perspective) and provides the means of making even better business-oriented decisions for the future. The airline can verify that its partners have shared their “best” flights and find ways to improve each partnership. In addition, by loading the SSIM of potential partners and applying all necessary rules, the airline can explore the possibility to co-operate with other carriers covering new destinations. 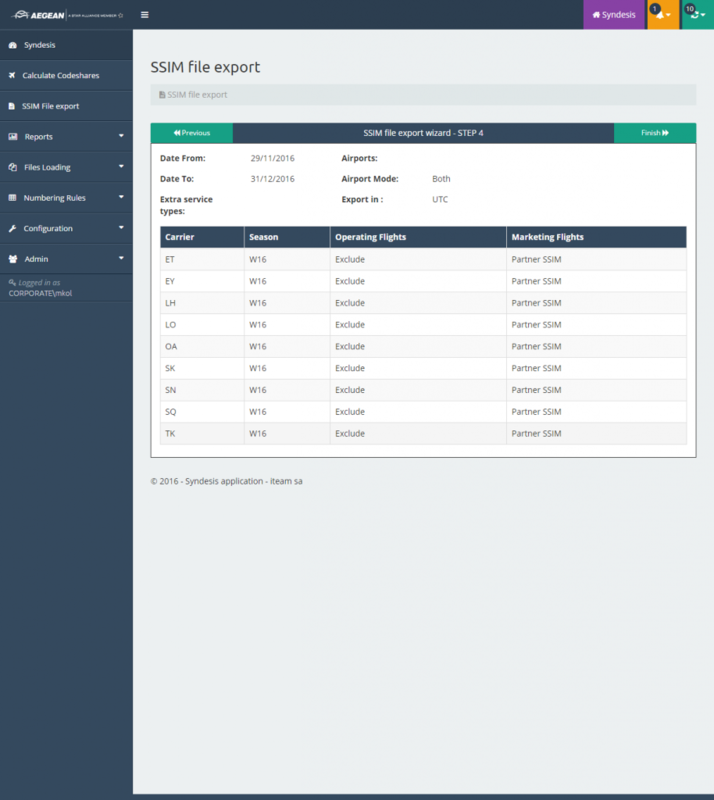 Through a comprehensive reporting system (comparing SSIM files or comparing SSIM file with calculated data) the application provides you with strategic data which facilitates the decision making process. 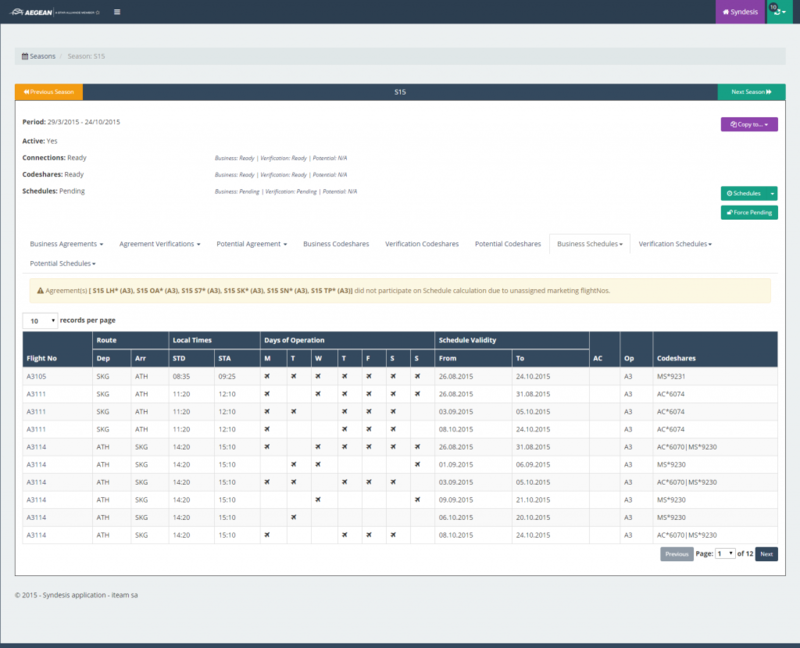 Automated calculation of optimal codeshare connections with no manual intervention needed. Automated flight numbers assignment, preventing mishaps such as double-entries or assignment of unsuitable numbers. Compare and check the accuracy of your codeshare connections as often as you wish to work around unexpected incidents that may disrupt your flights schedule. Combine automatically SSIM files within minutes with no human intervention. Expand your network by exploring new partnerships, reaching new destinations. Find the best codeshare connections through suggested options providing your passengers with a smooth flights experience. Increase your income by identifying new potential connections with your existing partners. Internal processes can be automated thanks to integration with existing systems. 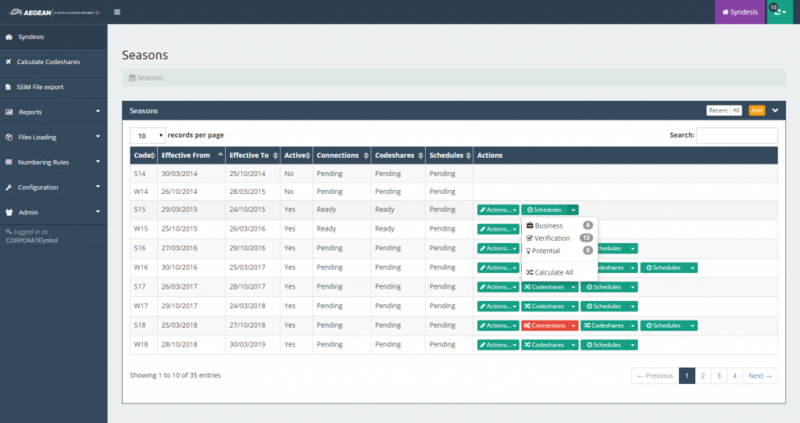 Create rules for the calculation of codeshare connections and define the order of their execution according your business needs. Possible integration with BI tools. Generation of reports to evaluate existing network and explore new possibilities.